Fender’s intriguing new range of stompboxes just got a little bigger with the addition of a clean boost, distortion and fuzz. We first checked out Fender’s new range of stompboxes back in May, and were very impressed with what we came across. It was a real statement that the big F was taking effects seriously for arguably the first time, and that sense was only enhanced by addition of three new pedals to the range at Summer NAMM – the Engager Boost, Full Moon Distortion and a fuzz, The Pelt. The distinctive look of the first wave of pedals has been continued here, with the same folded aluminium chassis, plus a textured metallic finish that appears to be anodised. We also see the return of what is possibly the cleverest battery compartment ever devised. For those who didn’t read about it last time, it’s effectively a spring-loaded hatch that you can prise open with your fingers, load up a battery and let it flip back into the closed position. We suspect there are magnets involved too, because there’s no way it can open accidentally. Genius. Other features common throughout include cute miniaturised jewel lights and metal footswitches. And if you have ever struggled to see your settings on a dimly lit stage, you’ll welcome the LED-backlit knobs. If all this talk of LEDs has you worried about battery life, you can turn them off if you’re not using a power supply, and battery users also benefit from a red warning LED on the battery compartment door that will light up when the charge drops below a certain threshold. 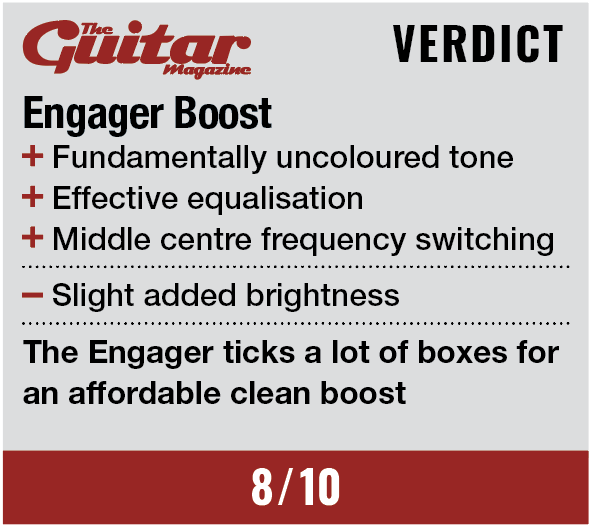 We’ll work our way through these pedals in order of gain – starting with the Engager Boost. This is essentially a clean boost with a level control that maxes out at 20dB, treble, middle and bass EQ controls with a +/-12dB range and a 400/800Hz switch for the middle control. You can no doubt guess what the Full Moon Distortion is all about from its name, but there are several interesting features. A hi-treble control augments the TMB tonestack and the pedal doubles up as a clean boost with a second footswitch and an independent boost control along with a mini LED status light.The texture switch toggles between symmetrical and asymmetrical diode clipping and the bite switch adds more gain in the upper frequencies, while reducing low end. 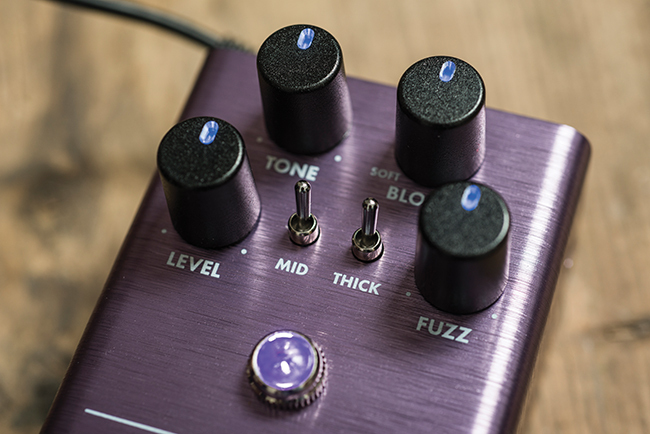 And finally the fuzz, in the form of The Pelt – a curious name that could be taken to mean ‘going full pelt’ but is most likely a reference to the amount of hair that this stompbox adds to your sound. It’s a silicon transistor based effect with the same level, tone and fuzz controls that regularly feature on fuzz pedals. The interesting additions are a three way mid-voicing switch, a thick switch that fattens the sound and a mysterious bloom control that ranges from soft to hard. Rather than being a clone of a vintage fuzz, the circuit is apparently an original design developed in response to player requests. Assessing boost pedals is contingent upon what you actually want them to do. The obvious application is to put the proverbial boot up your guitar signal’s behind to hit the first valve in your amp that bit harder, but then you need to decide if you want the colouration of a vintage-style treble boost, subtle tonal enhancement, absolute audio transparency or comprehensive frequency shaping. The Engager slots into the latter category, but it does so in a fairly transparent way. With the equalisation controls set as neutral as possible and level at unity gain, we detect a barely audible loss of clarity despite some added brightness, but it’s a better starting point than many boost pedals manage. The bass and treble controls behave as expected, but we find ourselves running the treble slightly shy of halfway at all times to overcome the Engager Boost’s inherent treble lift. Middle is the key control and playing through typical mid-scooped tonestacks, applying a boost on the 400Hz setting allows you to fill out the sound if you want to. Tweed, brownface and Vox-style circuits with single tone controls can sound a little boxy with the 400Hz boost, however. In this context the 800Hz setting, that can harden a mid-scooped tone, instead enhances definition along with the level boost. The knob LEDs and true bypass/buffer switch are welcome features and the buffer adds very little colouration. Placed anywhere in your pedal chain, the Engager Boost will preserve the treble content of your signal whether it’s activated or not. Moving onto the Full Moon, this really is an out-and-out distortion pedal. With the gain below noon it’s thin, overly bright and has a metallic rasp. Happily, things improve enormously as the gain increases and proceedings ease into a velvety sustain – but only with the treble and ‘hi-treb’ rolled back. The core voicing of this pedal is very bright, to the extent that it renders the bite and hi-treb controls rather redundant for all but the darkest guitars. 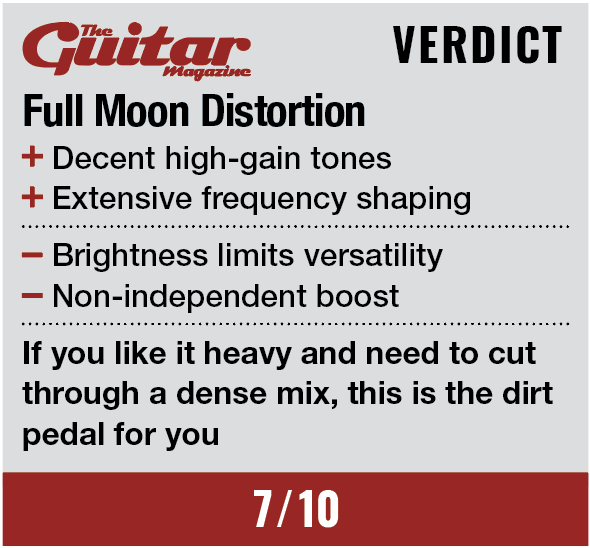 In isolation it can be rather shrill but check out our demo over at youtube.com/theguitarmagazine and you’ll hear how the Full Moon slices through a dense wall of fuzz. 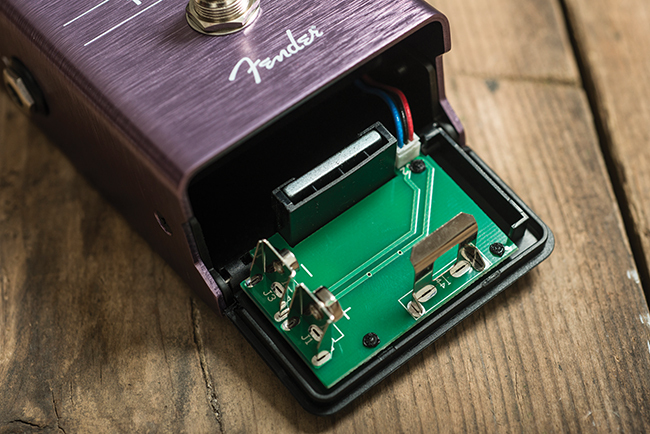 Configuring two independent bypass switches is fairly easy, so it’s a little surprising that Fender has chosen not to do it here – as a result, the Full Moon’s onboard boost can only be used when the distortion side is activated. However, since the boost comes before the distortion in the signal chain, it does wonders for the Full Moon’s tone when the gain is set lower. You can dial in some very credible overdrive tones with impressive clarity and a player-friendly dynamic response, but what we presume is the symmetrical texture setting (down position) always sounds a bit thin and uneven compared to the other option. As we move onto The Pelt, it quickly becomes clear that Fender has made a very decent job of making this a fuzz for all occasions. It can do the thick and seemingly infinite sustain of a Big Muff and the splatty, starved transistor vibe of a Maestro or Shin-Ei. Rather than damage limitation, the mid voicing switch provides useful onboard tone-shaping and it works effectively with the thick switch. The bloom control acts on upper harmonics, adding complexity as it advances to the point where single notes do indeed ‘bloom’ with harmonic overtones. Because we never find ourselves struggling for clarity, we can appreciate the tone control’s range rather than be obliged to keep it turned high. 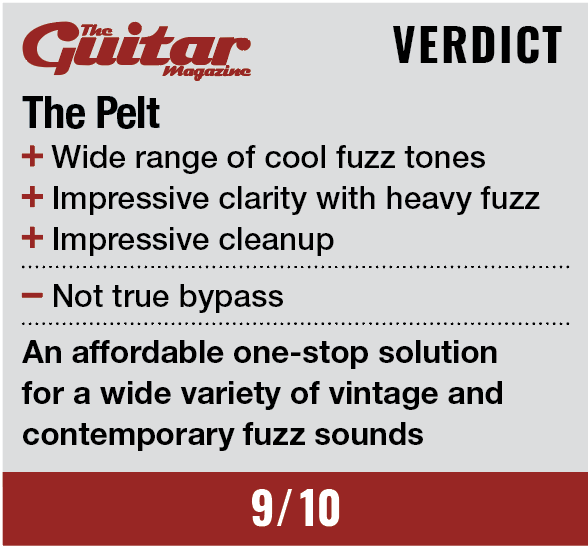 We also like the way this fuzz cleans up from the guitar to deliver a range of Hendrixy fuzzy ‘clean’ tones without the evenness of note decay being compromised. All these pedals are reassuringly solid, superbly priced, and do their jobs well. The Full Moon might be a little fierce for some, but if you’re looking for a tone-shaping boost, the Engage is a good-sounding option, while The Pelt is a particularly enjoyable and versatile fuzz.